Check Out These Custom Unique Men's Wedding Bands! Check Out These Custom Unique Men’s Wedding Bands! 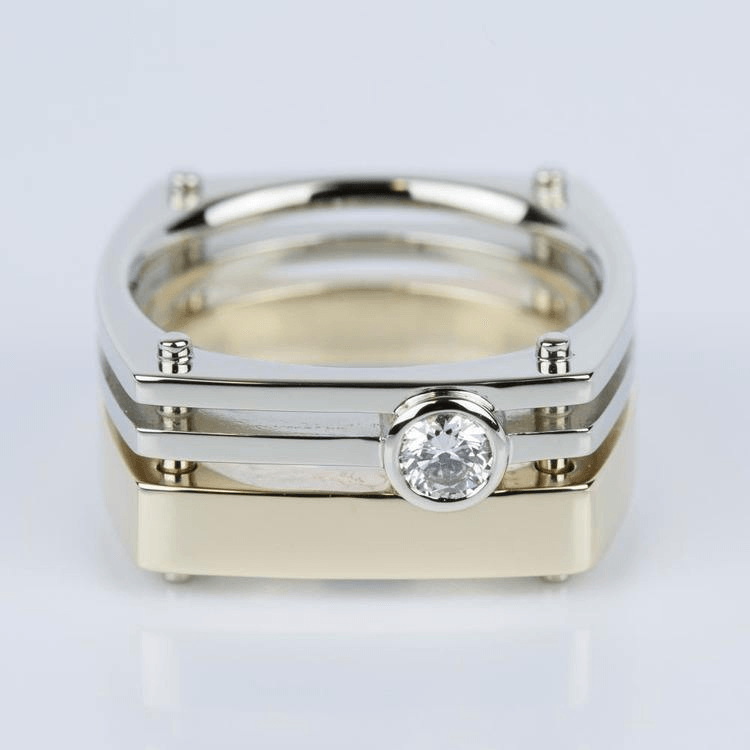 Customized designs are the ideal choice when you want a men’s wedding band that’s completely ‘him.’ Unique men’s wedding bands reflect his style and personality…and perhaps even capture a few shared secrets between the two of you. Create a ring that’s indicative of his passions, your relationship or maybe just something that’s fun and off the wall. When you can’t find the perfect ring in the stock collections, look to your own inspiration! We love creating different designs and looks for custom orders and are always amazed and in awe at the unique rings that our clients create. Going ‘custom’ for his ring is an easy process; you’ll work with Brilliance designers to transform your ideas into his perfect wedding band. Whether that means a band with an intricately carved wood inlay or a simple silver ring that features symbols of your relationship, custom men’s bands are a personalized symbol of forever! Marriage joins two individuals into one. 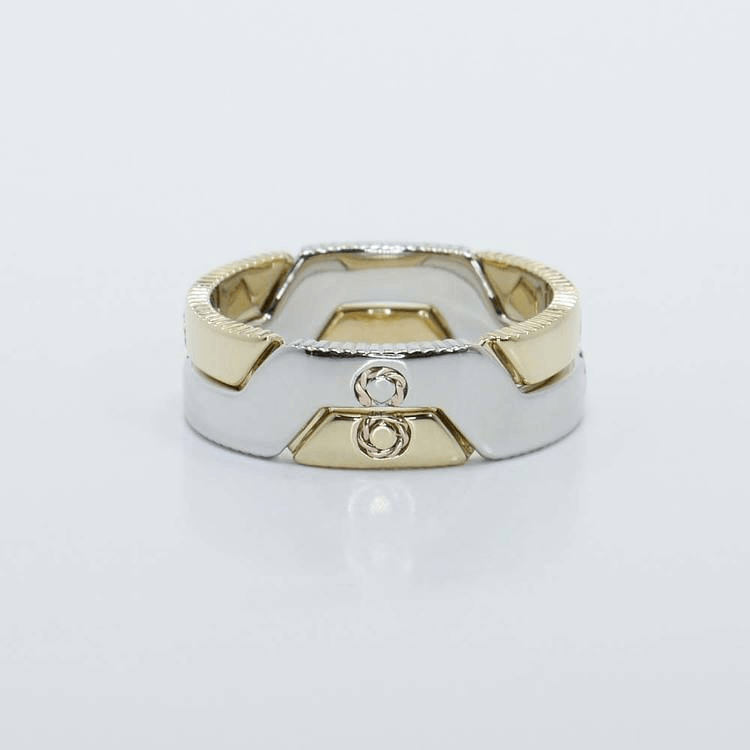 This symbolic unity is captured in a pair of wedding bands that were created with an interlocking puzzle piece design. The two bands are crafted in different metals—one is yellow gold, the other is platinum—but they piece together to form one band. Each piece displays one half of a rose gold loop to form the infinity symbol when stacked together. This ring showcases how sculptural appeal and function can be used in the design of a custom band; go beyond the surface to create an extraordinary display with his band…and yours, too! Diamonds may be a girl’s best friend, but that doesn’t mean men can’t have a ring with a little bling! Add a touch of brilliance with multiple small accent stones, or go big with a stunning solitaire if that’s more his style. This ring boasts a one-carat round brilliant diamond that is set within a white gold band flanked with yellow gold backset panels. These accent panels provide the illusion of a stacked design, which gives depth to the ring and draws attention to the centerpiece diamond. No ring can have too many diamonds! Tiny channel set diamonds provide fire and spark when set within a basic band. 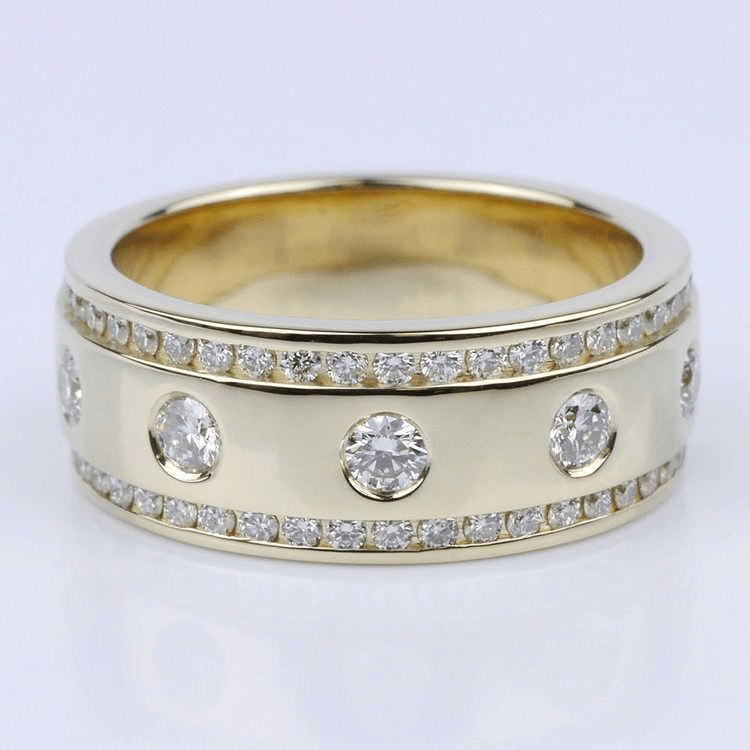 Use small diamonds to create a sparkling border around the top and bottom of his band. This ring design also uses a central row of inset diamonds to create another band of fire. Men’s wedding bands can take any form and shape. Think outside the circle to design a band that can be seen from different angles! Architectural bands like the ring picture above are a marriage of form and function. 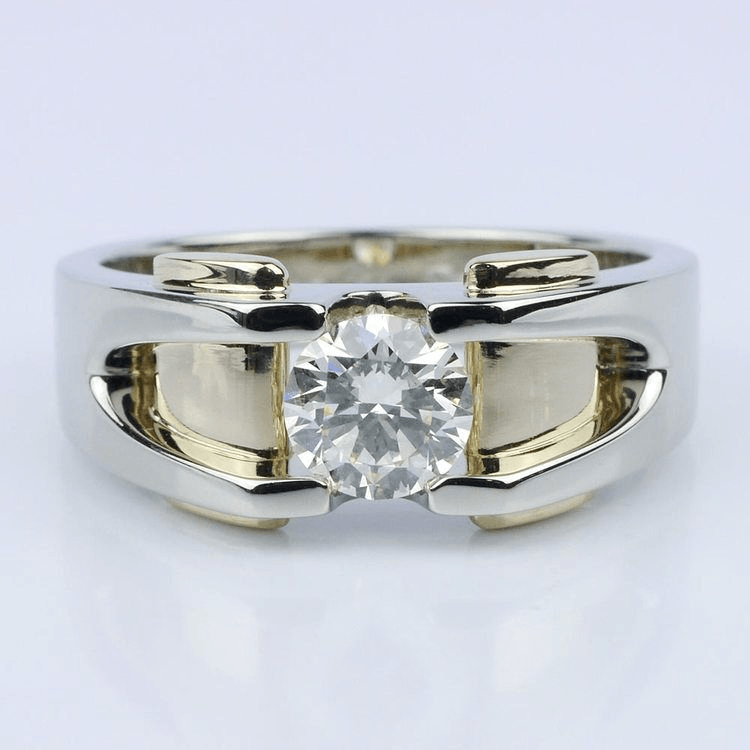 This custom design includes stacked squared bands in white and yellow gold. Small decorative screws accent each corner of the ring to allow the trio of bands to float within the setting. A bezel set round brilliant diamond sits flush right for a unique asymmetrical finishing touch! Any band may also be customized with an inlay personalized for him, from you. Engrave a wooden inlay with an inscription or a design that holds symbolic meaning. As each wood variety holds its own significance, choose the type that best captures him. Koa, for example, means warrior and is native to Hawaii. Oak is often believed to symbolize strength. Stock collections aren’t the only option to uncover his perfect wedding ring. Unique men’s wedding bands inspire creativity and custom designs ensure a one-of-a-kind ring. Use personalized engraving, gemstone accents, architecturally-inspired shapes and bold diamonds to design a ring just for him. A custom wedding ring ensures that the eternal symbol of your union is as unique as your love.